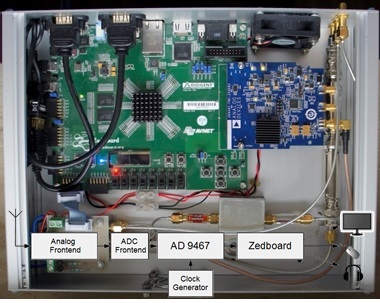 Modern tools like the Zynq development board provide the opportunity to build complex radio gear with programmable hardware. GUI, control and demodulation can be coded into embedded operating systems. Let’s wrap up this series on SDR Programmable Hardware with a look a Panoradio and it’s underlying technology. Panoradio is a modern direct sampling receiver built around the Xilinx Zynq system on chip, the same device used in Red Pitaya. As described earlier, Zynq is a combined computer and FPGA. A group of German hams added an analog front end and wrote some code to program both the hardware and software. What makes this project so interesting? The group used a Zynq Development Board, the green PCB shown in the above picture, as the foundation. This Zynq development board is the Zedboard. Like many development boards, it contains the target device, but also adds a whole bunch of functionality to make projects easy. These functions include digital inputs and outputs, as well as systems for video output and network connectivity. You can buy a Zedboard for around $500. One feature that makes Zedboard and similar tools attractive is the use of an FMC bus. FMC stands for FPGA Mezzanine Card connector. FMC cards provide add-on functionality. You can use them to attach high speed analog and RF front ends to the Zynq seamlessly. It’s amazing how far development or evaluation boards have developed in recent generations. Back in the late 1970’s, my first such board was the Fairchild F8 evaluation kit. This single board computer contained the modest F8 8-bit microprocessor. All I/O took place using a hexadecimal keypad and six digit LED display. After spending a month writing code to print my wife’s name on the LED, I gave up on assembly language programming for good! Panoradio uses the FMC connector to attach an Analog Devices 16 bit, 250 MHz ADC to the Zedboard, as well as some front end filtering. The result is a high performance 0-100 MHz direct sampling SDR. As you can see in the picture above, very little hardware or wiring was needed. Mainly programming. The ARM A9 CPU in the Zynq does GUI, demodulation and control, while the FPGA crunches the data from the ADC. Stefan, DC9ST and his friends do a great job of describing the whole project in this video. If you are willing to invest some time in learning about FPGA and SoC like Zynq, you can build high performance radios with very little soldering just by leveraging system boards like Red Pitaya and Zedboard. Have fun.